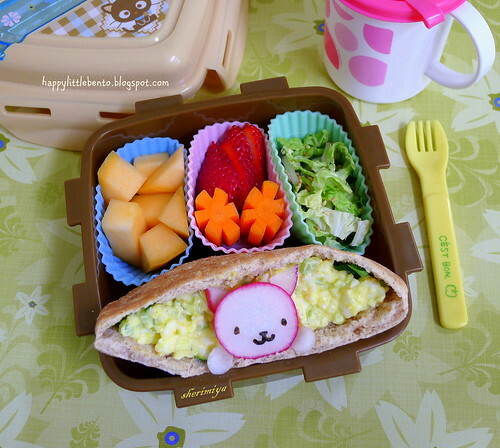 Nyan Nyan Nyanko Kitty Egg Salad Bento, a photo by sherimiya ♥ on Flickr. Guess what? I didn't feel like cooking for the bento today! So lucky TinySprite gets her favorite egg salad pita pocket sandwich. I tucked some shredded spinach into the whole wheat pocket before spooning in the egg salad mixture (this batch contains celery, onion, yogurt, curry powder and turmeric, salt and pepper). Then I decorated a radish slice with a nori kitty face. Ears and paws are also radish pieces. I snuggled some silicone cups of cantaloupe chunks, the absolute last strawberry, carrots and sesame slaw in this Chococat box as well. Happy weekend everyone! This looks really cute and delicious! Amazingly sweet bento! Happy weekend! Thank you Bentobird ~ hope your weekend was wonderful~! Super cute! Do you have a recipe for the egg salad? I've been looking for one... your's sounds so good! I don't follow a real recipe (and sorry for this late reply! ), but add to taste and also depending on whether adults or kids will be eating it. I've also been known to add hot sauce (for adults) or sweet pickle relish (which kids love). You can also chop in dill pickles themselves. Hope this helps!